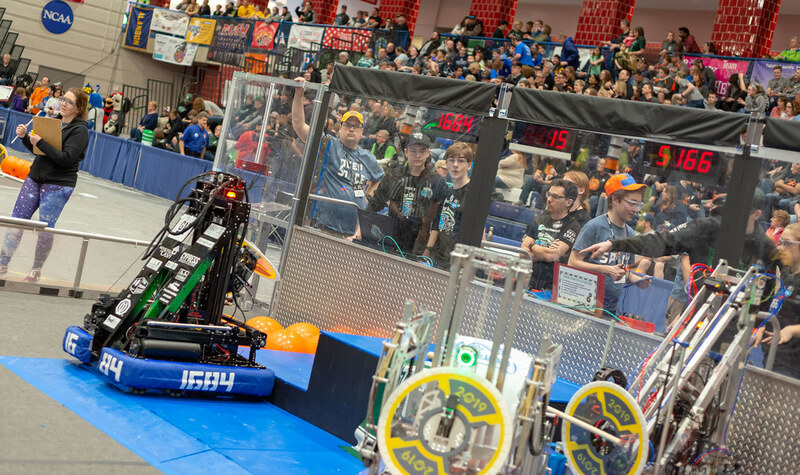 The Strike Zone’s robot, Voyager, is one of the top scoring robots in the state. 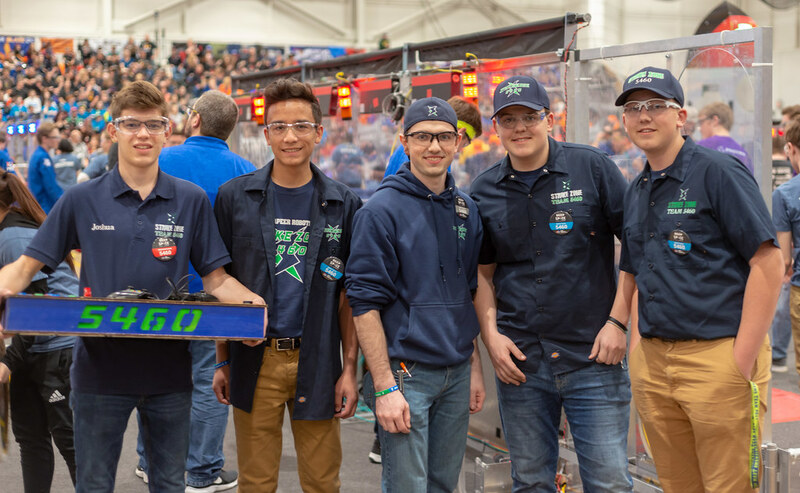 Lapeer Community Schools is proud to have two FRC robotics teams competing at the highest level in the state. The Strike Zone (5460) and the Chimeras (1684) turned in excellent performances at the FRC State Championship in Saginaw over the weekend. The Chimeras (Team 1684) lost in the finals of the Consumers Energy division. Their performance was good enough to improve their ranking in the state and ensure qualification for the World Championships April 24-27 in Detroit. The team also had the opportunity to help lead a seminar Wednesday on the process of building high performance robots with off the shelf items. This was a great experience for the team! Team 1684 is currently ranked no. 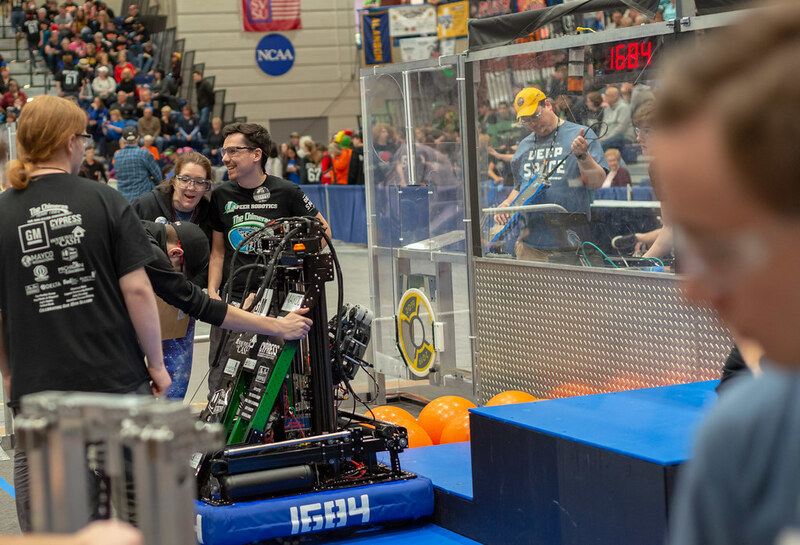 18 in the state after a run to the finals in the Consumers Energy Division at the FRC State Championship over the weekend. Meanwhile, Strike Zone (Team 5460) had a breakthrough performance. The team finished as the first overall seed and alliance captain in the Dow Division. In the final four, the Strike Zone led alliance beat the alliance from what was considered the strongest division (DTE) in the tournament and went on to the championship final. Strike Zone ended up tying two matches in the final, something that has never happened in the history of FIRST robotics. They tied in points and in the FIVE tiebreaker categories, twice! Tournament managers in Saginaw had to phone home to FRC headquarters, as this scenario had never played out before. In the end, the championship needed five matches instead of three to determine a winner. Strike Zone ended up finishing as runner-up, earning the no. 2 ranking the state and taking home a blue banner. This is an inspiring group of young people that takes pride in being student-led as much as any team in the state. Sophomore driver for Team 6460, Parker Duncan, was interviewed live on ESPN on Saturday afternoon. Strike Zone will now begin preparations to compete at the World Championship in Detroit. The state championship event was covered extensively on ESPN3 and several of our students were interviewed on live tv. Click here to watch the ESPN broadcast. We could not be more proud of what we have going with our robotics program across the District. It’s something we can all be proud of. There are 542 teams in Michigan and we have two in the top 20 (Strike Zone is #2 and Chimeras #18). We are so incredibly grateful to all the sponsors, mentors and parent volunteers who make this possible. Thank you so much!